As a prominent and growing tourism destination in Southern California, Palm Springs was seeking web and mobile tools to showcase their city offerings. With seemingly endless options of restaurants, hotels, attractions, shops and more, the Palm Springs Bureau of Tourism needed to provide a way for both their residents and visitors to navigate these choices and explore the city. CivicConnect offered the ultimate tool to support travel and tourism, as well as smart and sustainable urban mobility in the city of Palm Springs. Visit Palm Springs provides up-to-date, relevant information on where to stay, play, dine, and shop. The application even offers exclusive access to local deals that promote local businesses in Palm Springs. The CivicAR® Augmented Reality (AR) features provide innovative, contextual ways for users to engage with all of the city’s offerings, drawing attention to this growing tourism destination. CivicConnect also integrates the local transit option in Palm Springs, the Buzz Trolley. An interactive map shows stop locations, routes and real-time locations of the trolleys. This feature recognizes getting around as a crucial element of tourism, promoting ridership and economic development in every corner of the city. The Palm Springs Bureau of Tourism can ensure they are not only promoting their city as a rising destination to visit and live in, but directly promoting local economic development for their restaurants, hotels and other businesses. The Visit Palm Springs application received substantial media attention for its CivicAR augmented reality features, and won various awards including a Gold ADDY Award. 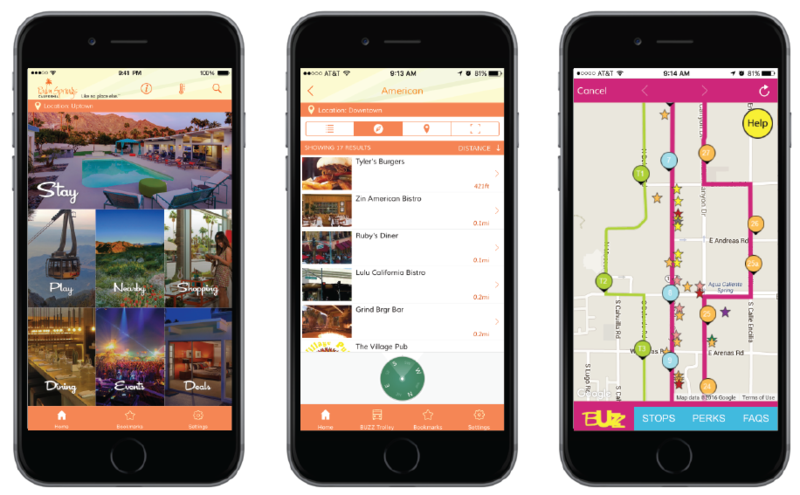 CivicConnect allows the Visit Palm Springs solution to stay current and expand as the data, attractions and visitor and resident numbers in Palm Springs continue to grow.